My DW788 Scrollsaw Review and purchase experience. I was told the saw would be received in a week and I got it in about 4 days which was really nice. I also bought the stand that goes with the saw for an extra $46 and it was money well spent. The stand was very easy to assemble. I unpacked the saw (I bought a Used but New one) and could tell the saw had been opened and then repacked. The saw was in perfect condition, no scratches or blemishes at all. I picked the saw up and placed it on the stand and put the tear drop table on which was a snap. I looked for the 2 bolts to mount the table to the saw and found they were missing. These were M8 Hex head machine screws so my local hardware store carried them, costing about $.86 a piece. When I went to insert the blades I noticed the thumbscrews were also missing. These are M6 screws so I went to the hardware store and bought 2 M6 hex head machine screws and these worked. I super glued an Allen wrench into the hex heads for a better handle to tighten the screws with. Another part, the foot which holds the material down was also missing (yes I was upset at this point but trudged on). This piece I could not purchase locally so I called Amazon and told hem via Chat what my situation was. They offered me a $25 refund but I wanted to see what all these parts would cost me, which was around $40 with shipping. So I contacted Amazon the following night via chat and explained my situation and they gave me a %20 refund which was very nice, no questions asked etc. So even though I was missing a few parts I was still able to use the saw which cost me $400 with free shipping. Now on how the saw performed. I previously owned a Hitachi scroll saw and this thing vibrated like there was no tomorrow. Hard to control and the blades kept popping out. The DW788 does not accept pin-in blades but that’s fine with me. When I turned on the DW788, it was so smooth and so easy to use, I wondered why I ever bought anything else. So easy to change and tighten the blade, you can slow the speed down very easily, I was like a kid in a candy shop. Heck I didn’t want to go to bed it worked so nice. I had read about a guy who did a vibration test by balancing a nickel on his work bench to see it the vibration would knock it over. I didn’t have a coin so I placed my beer on the saw table and it did not budge. WOW! an excellent saw plus a beer holder. 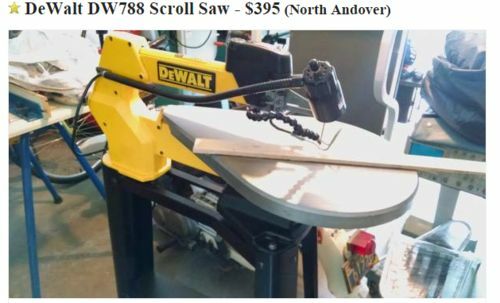 I purchased the same Dewalt scrollsaw last year and agree that it is an exceptionally smooth and easy to use scroll saw. great value for the money. However, I ended up being one of those people that thought i would use it alot and it ended up just the opposite. I have probably put 10-15 minutes of use on it and now it just gathers dust. For anyone who uses a scroll saw frequently it seem sto be the best in its price range. Yerars ago I had a Craftsman scroll saw and and it vibrated so much that it would vibrate off the table if you did not secure it down. I too have this saw. I purchased it from a guy in NH on craigslist for $75 (yes I feel like I stole it). It looked like new and runs like new. He said there was just a few hours use on it. Like Greg, I don’t use it much but it’s one of those tools that when you do need it there’s not much alternative besides a hand scroll saw, unless you have a lot of scrolling to do in a project then it’s just a godsend. I too had an old craftsman I called thumper. This saw is smooooooth in comparison. I worked with 5 of these saws at a summer camp. Yes they are great saws even with kid abuse on them. The only long term maintenance that we really had to do is on the centering set screws at the top and bottom of the blade. These four set screws will vibrate into different positions even thought they have locktite on them. Every hundred hours or so, take a look to make sure that they didn’t move. Other than that, these saws are fantastic and if you need a scroll saw, worth the money even at the full retail price. Looks like a nice saw. I too have been toying with the scroll saw more this summer. Doing smaller projects and having more fun. Good luck with the saw. My Grand daughter drew me a fantastic dragon that I plan to cut out on the scroll saw and make into a wood burning project for her and I. $75 , yup you did steal it. If I ever run across a deal like that, I will buy it evne if I already own one lol. Thanks for the tip Mike i will keep an eye out on the centering screws. I also own this saw and it’s great. One word of advice though..ALWAYS back-off the top blade holder knob when you are not using it. If you do not do this it will eventually break the blade holder because of the constant pressure (tension) on it. They are only made out of aluminum cast. I learned this the hard way…. Thanks for the tip Dave, I was out in my shop making sawdust (actually a pair of sawhorses I saw here ). I loosened the blade holder on my scroll saw. I own this also, and it works exactly as promised. great saw. I have a suggestion for you. Don’t bother ordering the foot that holds down the material. It is basically useless and most scrollers remove it themselves anyway. Just get used to holding the material down with your hands and you won’t have that in your way and needing adjustment every time you switch to a different thickness material. What makes it a version 2? What are the differences? I too have this saw and had the same impression of it being exceptionally smooth. Ditto’s on forgetting the foot as it is almost useless. I ditched it almost immediately. Check my projects and you will see three useful projects for this saw. I’m considering purchasing this saw used on CL. A couple of the responses here scare me because I think it would be the same for me. I have an older scroll saw that I’ve used ONCE. I feel like this is a nice saw in awesome shape and if I ever did use it, it would be awesome, but … I’m having reservations about spending the money. The DW788 is my favourite scroll saw as others have mentioned it is very quiet with virtually no vibration, which makes it a joy to use.